A couple of actor punks from the 1980s/90s period, Elizabeth McGovern and Campbell Scott, portray a grown up flapper-era married couple from Kansas with welcome sensitivity. It is McGovern that shines, as the title character, as it is her journey that upends several lives, up to and including her young about-to-be-a-star responsibility. Haley Lu Richardson (“The Edge of Seventeen”) solidifies her up and coming status by creating a memorable Louise Brooks, a person ahead of her time. The pairing of chaperone and starlet makes for an absorbing narrative, combining the morality of the time with an emerging show business dynamo. 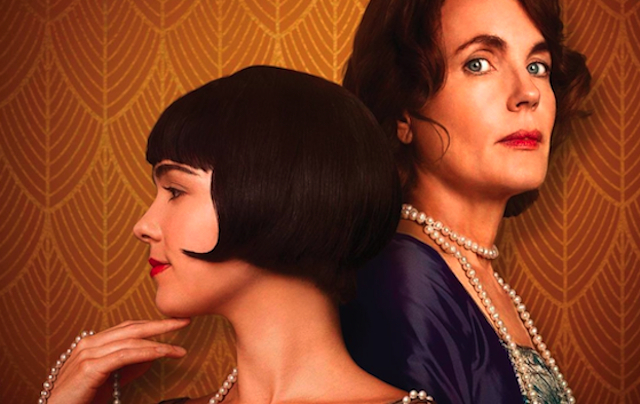 Louise Brooks (Haley Lu Richardson) is itching to leave her Wichita, Kansas, straitjacket and practice modern dance at a famous school in New York City, run by Ruth St. Dennis (Miranda Otto). 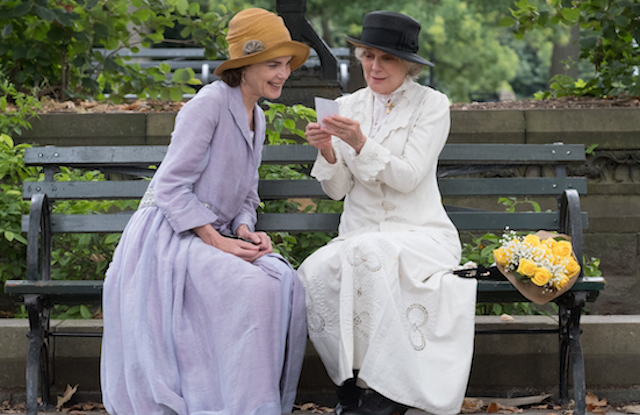 She needs a chaperone to the big city, and local woman Norma (Elizabeth McGovern) volunteers, leaving her family and husband Alan (Campbell Scott) to fend for themselves. The two travelers are at odds, as Louise proves to be precocious beyond her teen age years. After arrival, she begins the school while Norma takes care of an errand. The chaperone was adopted from an NYC orphanage and shipped to Kansas, and she uses subterfuge and help from handyman Jack (Geza Rohrig) to find the name of her birth mother, and start in motion a series of life changes for all. McGovern strikes the perfect balance between Midwest rube (I can’t imagine a journey in the 1920s to NYC from that simple territory) and determined seeker. She musters a lot of courage to accomplish the real reason for being in New York, and she becomes more complete as the film progresses. She is able to uptick all the other characters during story interactions, including a perfectly played scene between her and Blythe Danner, meeting as biological others for the first time. The rest of the cast is high level, even in the smaller supporting roles (Geza Rohrig, for example, was notable in “Son of Saul”). Haley Lu Richardson completely understands the Brooks character, even to the point where she portrays her 20 years later. In many ways, the real-life Brooks was the prime example of how Hollywood discarded women in those early days. Campbell Scott, Danner, and Miranda Otto as Ruth St. Dennis all get their moments, and they all created performance heat. Julian Fellows of “Downton Abbey” fame adapted the story (from a novel), and gave it the proper dramatic structure, close-but-not-quite a soap opera. Director Michael Engler was able to recreate 1920s America effectively, especially through the characters, with a eye toward universal truths in any era. The social history of America is always interesting if done right, and in “The Chaperone” the 1920s come alive, through a repressed Midwestern matron and a fly-by-night rising star. Louise Brooks has a bit of a Chicago connection. It was she and Chicago-born Colleen Moore that epitomized the “flapper” in ‘20s cinema, and popularized the “bob” hairdo. Brooks went on to be a pundit and notable author. Moore was a contributor to philanthropic arenas in Chicago. Both were pioneers in feminist freedoms, and both went onto to eventual self sufficiency, and more importantly, self satisfaction.